Top Row: (rings) Mesh with Diamond & Ruby Buckle Ring, Diamonds & Ruby Dome Ring, Triple Rosecut Diamond Band, Green Gold Engraved Band, Chrysoberyl & Rhodolite Garnet Ring. (pendants) Diamond Pin Pendant, Diamond Sunburst, Onyx & Diamond Locket , Black Enamel & Pearl Locket, Rosecut Diamonds & Black Enamel Locket, Rose Gold Heavy Watch Chain. 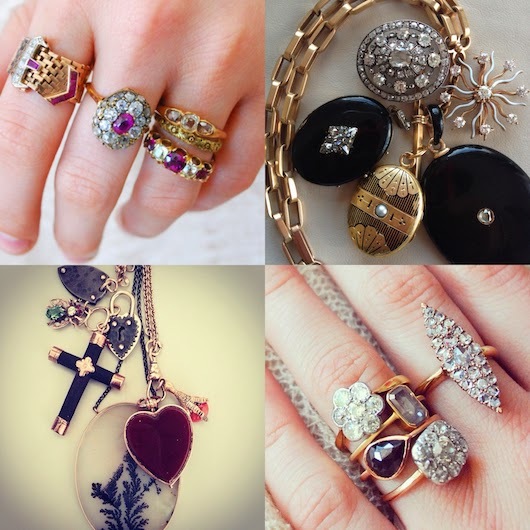 Bottom Row: (pendants) Coral Claw Charm, Carnelian and Bloodstone Heart Locket, Rebecca Overman Picture Agate Pendant, Philip Crangi Steel & Gold Charms, Wood and Rose Gold Cross, Diamond & Gemstone May Fly Charm (rings) Pave Rosecut Diamond Navette Ring, Georgian Diamond Rectangle Cluster Ring, Gillian Conroy Black Pear Shape Diamond Ring, Gillian Conroy Emerald Cut Grey Diamond Ring, Platinum & Diamond Cluster Ring. 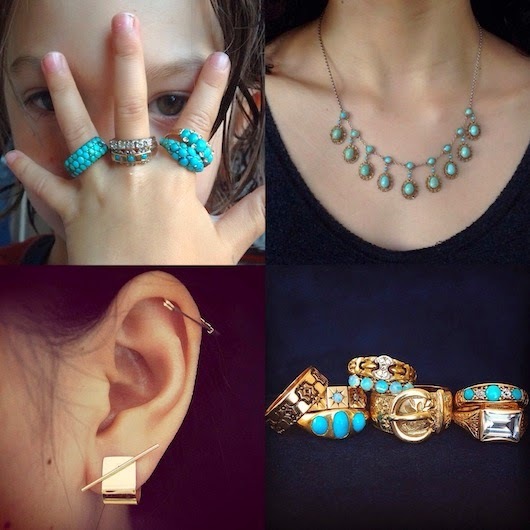 Top Row: Victorian Silver and Pave Turquoise Ring, Deco Five Diamond Band, Turquoise & Diamond Scalloped Ring, Turquoise Dome Ring, 1920's Vermeil and Turquoise Necklace. Bottom Row: (earrings) Kathleen Whitaker 14k Stick Stud & Ear Cuff, Gillian Conroy 14k Safety Pin Earring, (rings) 14k Pattern Embossed Ring, Opal & Diamond Ring, 18k Three Turquoise Ring, French Gold & Diamond Chain Ring, Opal Ring, Buckle Ring (sold), 18k Diamond & Turquoise Band, Victorian 14k Aquamarine Ring.